UJBL: What has changed on the global IP protection landscape over the past year? 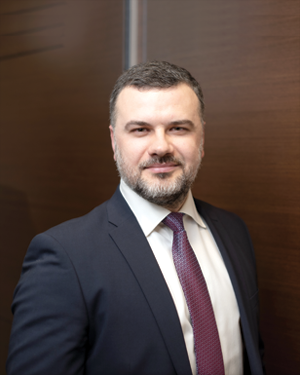 Yaroslav Ognevyuk: After a closer look at the changes in global IP protection over the last year, it becomes clear that those changes are tightly intertwined with the state of the world economy, which features a number of consistent trends. The global economy is becoming more and more competitive, which means that intellectual property remains a powerful influence tool that affects competitive relationships. Since the global economy is becoming more and more science-based, it brings with it grounds for plentiful scientific studies and, as a consequence, an increasing number of patent applications. The level of world trade is on the rise, and business is increasingly interested in increasing foreign investment. This, as a result, inevitably speeds up globalization processes and consequently leads to greater unification as to protection of IP rights on a worldwide basis or at the level of international political and economic unions. Over the last year, a significant increase in the number of technological developments took place as well as rapid dynamics of state-to-state transition from physical systems to a virtual online economy environment, which gives rise to the development of some new ways to carry out IP rights protection in the digital area. There is also a consistent trend in trafficking in counterfeit goods at the global level. This becomes possible not least because of a number of factors contributing to the development of counterfeiting. To name but a few: geopolitical economic wars, international public sanctions, and the like. Numerous countries are becoming grey zones for international business and are, in fact, growing to be a preserved area for counterfeit business which, in turn, finds ways of setting up distribution channels which spread counterfeit goods right across the world. UJBL: Do you feel competition from the growing number of technological solutions available in the area of IP protection? Perhaps, you order their services as well? Y. O.: Few would argue that genuine competition with technological solutions, including in the field of IP rights protection, is inevitable in the future. Competition with technology is already being felt in the sphere of trademark prosecution services. Having said that, international corporate clients who have a huge worldwide trademark portfolio, improve their technology on a year to year basis, and this in turn reduces the load on their external consultants. Even now, it’s quite obvious that the use of technology is currently a competitive advantage as it allows the provision of services faster and better, on a larger scale and, last but not least, is quite often cheaper. Our company uses technological solutions to optimize our lawyers’ time and the process of providing services, expand the number of services, and make them as affordable for our clients as possible. We also invest in the development of IT products that we believe will be in great demand in the foreseeable future. 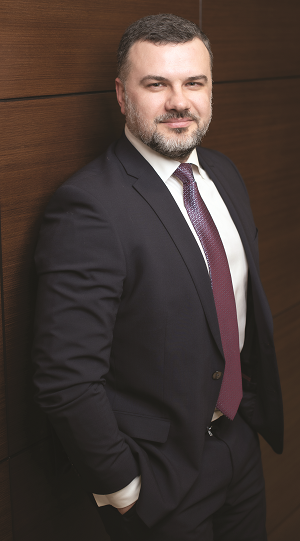 UJBL: Clients face new challenges and are making greater demands of their legal counsels. What has changed recently in the minds of in-house counsels? Y. O.: I have often seen disappointment among in-house lawyers from some law firms over selections by internal procurement departments in accordance with special tender procedures. This is because internal procurement departments would never select a consultant who provides very high-quality services but for a competitive higher price. Since one of the main KPI indicators for internal procurement departments is budget savings, in-house counsels became hostages to poorly selected consultants and, as a result, received poor performance from the winners of tender procedures. Furthermore, in-house lawyers, when performing their duties, are bound by a worldwide trend towards increased compliance control in business. The international business press eagerly highlights cases where senior executive officers of international companies are accused of abusive practice and fraud. Such cases often did not appear due to the fact that senior executive officers were directly involved in unlawful actions, but those people who occupy the highest corporate positions carry full legal responsibility for all violations of the law committed on behalf of the corporation. In other words, senior executive officers, as the main in-house customer, give a mandate to their in-house counsels and special compliance officers to tighten control over compliance procedures to an appropriate level through the help of external lawyers. At the same time, control over compliance procedures should be confirmed not by the formal signature of the external lawyer’s adviser firm about familiarization with the standards of compliance with the client’s procedures, but by the conclusion of a client audit of compliance with such procedures. UJBL: Would you single out certain industries (economic sectors) that are particularly active in protecting their IP rights in Ukraine? Y. O.: Over the years, such sectors of the Ukrainian economy as pharmaceuticals, food and beverages, tobacco, agrochemicals and IT, have been actively protecting their IP rights. In addition, due to the staging of the UEFA Champions League Final in Kyiv last year, there is also a burst of activity in the sports entertainment industry. More recently, the creativity and innovation of small and medium-sized Ukrainian businesses has intensified, though it’s too early to assess the proper level of attention by domestic companies towards issues of intellectual property protection. UJBL: How do national courts implement the provisions of the Association Agreement signed with the EU that contravene valid Ukrainian legislation? Y. O.: As a general rule, courts recognize the greater legal force of an international treaty. 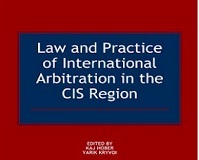 However, the obstacle to the implementation of the Association Agreement with the EU is not related to any conflict with norms of domestic legislation, but the procedural uncertainty of further implementation or the most convenient way to execute the provisions contained in the Association Agreement. 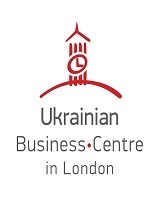 Many provisions of the Association Agreement are of a declarative nature and neither the Agreement itself nor current legislation of Ukraine provide legal mechanisms for the direct implementation of the Agreement and control over such implementation. This issue is particularly acute in legal issues regarding protection of geographical names which are protected by the Agreement. UJBL: Can you name the most sophisticated cases in your recent practice? Y. O.: We have many interesting and complicated cases, but I would like to highlight three which, if a solution is to be found, might serve as a judicial guideline for corresponding cases. Their complexity is determined by the fact that there is no proper legal regulation and legal practice, and there is no legal position of the Supreme Court of Ukraine. Firstly, the level of protection for the name of a company at the time of acquisition of rights concerning rights associated with the name of the company in Ukraine. Secondly, the number of services for which legal protection of the brand name extends to. I predict that in the future this case will be considered in the cassation instance and a clear legal position from the Supreme Court on these issues is expected. Another litigation process with the same client is interesting because it combines both cancellation demands and infringement action against trademark usage, including the company’s name and domain name. The complexity of this case is first of all in procedural moments, where the court should adopt an intelligent decision, which should be well-grounded. In particular, the court has to establish whether the defendant from the Russian Federation was properly informed, and the court should determine the validity, enforceability and admissibility of an array of evidence, since both parties provided the court with a lot of expert testimonies, reviews and other evidence, and there are already several conclusions of forensic examination. Therefore, when providing a legal assessment of all the evidence, the court will have to investigate a very large amount of information. Another case concerns a patent dispute between an international pharmaceutical corporation and a domestic pharmaceutical company over patent infringement and the possible exhaustion of patent rights. This case is of great interest because, for the first time in court practice, we see a case where a court should establish what terms like “scientific purpose” and “using the invention for scientific purposes” actually mean. Given that the concept is not clearly defined by law, the court has to assess the evidence of the two parties regarding the features that “scientific purpose” and “using the invention with scientific purpose” have. The last case is interesting due to the protection of an unregistered geographical name through the nullification of a trademark, which includes this name. The complexity here lies in the fact that the court should establish the similarity of a trademark with a simple geographical name, as well as the possible misleading nature of the trademark concerning other trademarks and the people who hold it on the basis that there are some special qualities of a product from a particular geographical region. An interesting peculiarity of the case is that the plaintiff is a non-profit association that unites alcohol producers from a particular region and the court has yet to establish whether or not there are any violations of rights and the plaintiff’s interests protected by law. 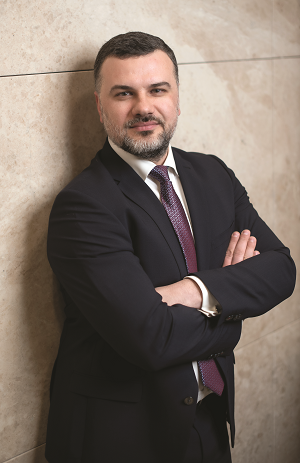 UJBL: Could you single out new services of IP practice in Ukraine? Y. O.: I believe two such new services are GR services for legislative changes, and procedural regulation of ways to protect IP rights. Clients from one sector of the economy could be interested in such services, usually due to the merger process to an industry trade group. Investing in legislative changes that could improve the level of legal protection of intellectual property objects is a strategically and financially justifiable step. In the long run, such an investment will always pay for itself through the elimination of long-term cost problems or reducing the cost of further protection while improving the effectiveness of such protection. 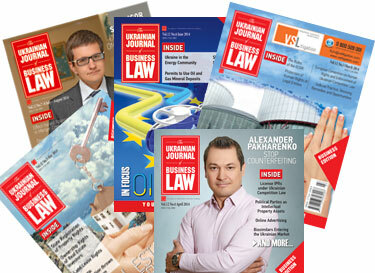 UJBL: You joined one of the biggest full-service law firms in Ukraine in February. What are your goals for the coming year? Y. O.: New significant horizons, landmarks, opportunities and challenges have just presented themselves, so there is more than enough work. Our main task is to expand the scope of our IP practices on the market, primarily not through redistribution of the market with other law firms, but by expanding the IP services market by offerings new services which are in great demand. But there are simply not enough offering for new clients who, due to a variety of different reasons, still pay relatively little attention to the protection of their intellectual property rights. In addition, at the IP practice of Sayenko Kharenko, we are creating a regional anti-counterfeit management hub which will work as a professional counterfeiting trouble shooter in a number of Eastern European and Central Asian countries. Our vision for fighting counterfeiting has received a lot of praise from a number of large international companies which, in their own words, “waited a long to solve problems in a lawful way” as we have proposed.